We in the industry knew it wouldn’t be long before someone created an app that connected the iPad directly to any standards-based videoconference codec. 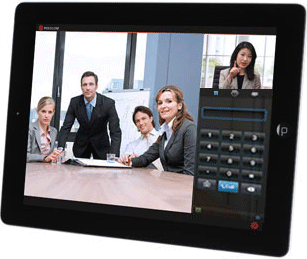 Sure enough, Polycom has recently launched their RealPresence™ Mobile app for the iPad. If it is free video conferencing you are looking for, then grab your iPad and search for the Polycom RealPresence™ Mobile app. You won’t be disappointed.We road-tested the RealPresence™ Mobile client in a number of situations and were pleasantly surprised at the ease of connection, video and audio quality. We simply launched the app then dialled out to a Tandberg test IP address. No configuration of the router was necessary and we were able to send and receive both video and audio at 384kbps at the first attempt. We carried out our next test sitting in our local McDonalds restaurant (at lunch time.) With our iPad connected to their network, we dialled into our RMX2000 video bridge. Again, we were connected first time. We entered the meeting pin and then waited for a colleague to connect from an ISDN site. Sure enough, within two clicks we were having an IP to ISDN videoconference over a McDonalds restaurant wifi network while eating burgers and slurping cola. As part of their new ‘software’-focused offering, aptly named “RealPresence™,” Polycom launched the M100, a scaled down but fully functioning version of their CMA desktop client. Although the M100 is currently only available for Windows 7 & XP, there is talk of a Macintosh version, which is hovering over the release horizon. CMA users can pick up the Macintosh version when they purchase a minimum of 50 client licences. The good news is that Polycom are running a scheme where you can buy 50 licences (mixed PC & Mac) with a generous 50% discount. So the next time you want to videoconference download the free RealPresence™ app via the apple app store and connect to any standards based video conference. if you want to connect to more than 1 other location in the same conference contact bridge@videoconferencinglondon.co.uk and ask for a virtual meeting room, which will give you the ability to connect up to 9 sites in a HD conference plus up to 30 voice calls in the same conference. We believe in connecting people and want you to enjoy the benefits of true collaboration without having to pay a premium.